MAYBE he couldn't afford a real beach vacation after buying a Maserati. Or he didn't have the social connections to score membership to Rose Bay's exclusive Royal Sydney Golf Club nearby. Or maybe he's just the victim of a GPS fail. 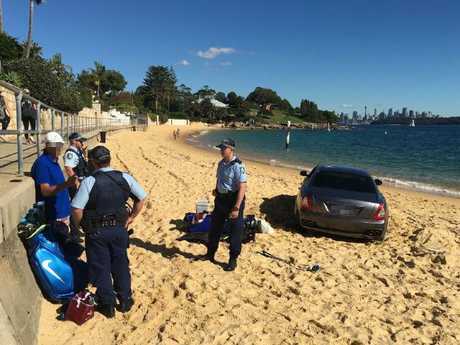 Whatever the reason, police weren't too impressed with this bloke after he drove his car down a ramp at Camp Cove near Watsons Bay this morning, then proceeded to play golf on the sand. Police were called to the scene at 10.15am. The car was towed away at midday and the 51-year-old man was taken to St Vincents Hospital for assessment. His Maserati and his possessions, including the golf clubs, were impounded. Police have yet to decide if any charges will be laid. Italian tourist Taciane Ronsani said she arrived at the beach just after 10am to see the driver of the car, a Dutchman, walking around in shorts. She said he told her he felt "lucky" he had bought the expensive car second-hand, paying $100,000 instead of the $250,000 price tag. Maserati's can cost upwards of $300,000. "He was playing golf, and then he said he would dig his car out…. He was a nice guy… he wanted to have a chat," she said. "It was like something out of a movie scene." 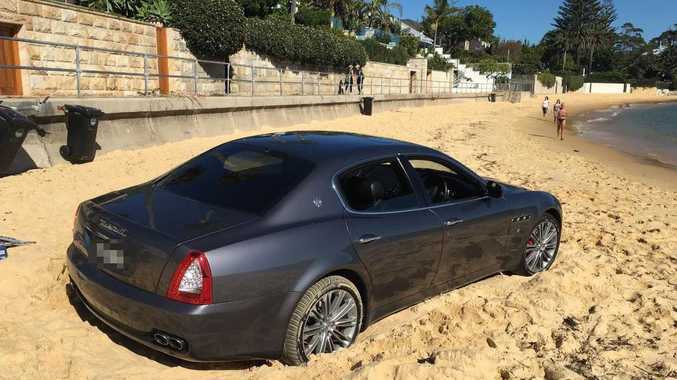 A diving instructor said that he was about to brief his group of divers when he spotted the expensive car bogged in the sand. "He comes over to us and he is talking a million miles an hour," he said. The instructor said that the man told them that because his car could go 350km an hour he believed it would have been fine on the sand. "We offered to help him push it out, but he just started digging with his hands… then he started hitting golf balls into the water," he said. The man had emptied the cars contents onto the sand, with boxes and golf clubs strewn around the beach. "He looked like he was the owner of the car, late 40s early 50s," beachgoer Alun Watkins said. "I don't know that state of his health but police called the paramedics to check him out. "He had taken everything out of the car for some reason, he had very expensive golf clubs, with a designer bag. "He is a wealthy guy, I don't know exactly what the situation was." Diving instructor Miguel Garrido was surprised to find the car at the popular diving spot today. He said the man was teeing off at the beach and other divers said the man was complaining of a relationship which had recently ended. "People get angry when their marriages break down, but you go to the driving range not the beach when you want to hit some balls," Mr Garrido said. He said divers mentioned finding numerous golf balls sitting at the bottom of the harbour. It is not known when the car came to be parked on the beach. Expensive cars on Sydney beaches seems to be something of a trend lately, although the Northern Beaches appears to be the favoured spot. 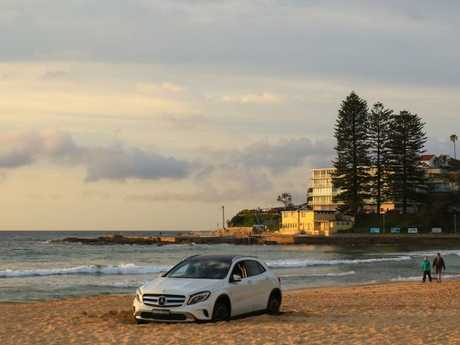 In September last year a $67,000 GLA 250 4MATIC Mercedes got stuck in the sand at Dee Why Beach, with the driver claiming he was unaware that driving on the beach was illegal. 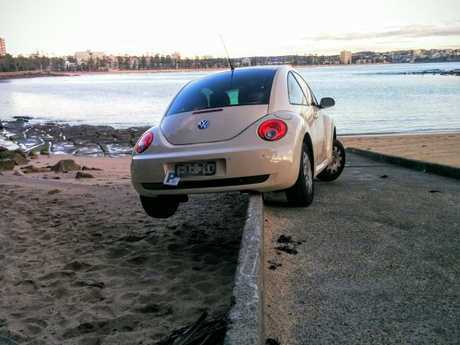 Little more than a week later a P-plater's trendy Volkswagen Beetle got stuck on a boat ramp at Shelly Beach. The driver blamed her GPS. The same month a woman jumped out of her car after a huntsman spider fell into lap, only to watch her vehicle slide down the Bayview boat ramp in Rowland Reserve and into the sea.